We are Family…and 100 posts!!! What is the “perfect” family? The “typical” family? Modern tradition (though not accurate) may say two parents, husband and wife, and two children — a girl and a boy. 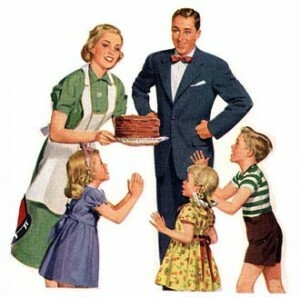 Back in the day, families consisted of two parents, husband and wife, and as many children as they could possibly have. Big families ensured that enough people would survive to carry on the bloodstream. To me, big families also mean lots of people who know you, understand you and love you; lots of people who can pass on the traditions that give this country its character. I have what some may call a modern traditional immediate family, but my family is small overall. My mother was an only child and my father only had one brother. I have but two first cousins, 1 uncle, 1 aunt. I lost my grandparents at a young age, and barely know any relatives beyond a few second cousins. But the idea of family is something that I have always valued. So I subconsciously studied other people’s families — their relationships with their siblings, grandparents, cousins. I actually think this might partially explain my obsession with Italian Americans. All the Italian Americans I know have big, close knit families — something I always craved. I know, I know, I shouldn’t make assumptions based on culture, but you can’t help what you see as true. I actually find it ironic in a way the media spectacle that was Nadya Suleman (aka Octomom). While I don’t agree with the way she went about building a family (I just think it’s a little irresponsible, and well the pictures were just yucky), she was basically building a big family — the way that families used to be. I always envisioned myself having two kids. I really want a girl one day so I can teach her to be a better woman than I am, and I want a boy too, so I can learn about raising both, and so that they can have each other and not grow up lonely, or too spoiled. I never thought about having more kids than that, which now that I’m old enough to really think about it, I think is actually realistic. Kids are expensive! It costs almost a quarter of a million dollars to raise a kid, and that doesn’t include college! But I do want a close family. It may not be big, but I will do everything in my power to make it close knit family. I hope you enjoyed my 100th post! It’s been quite a ride so far! In honor of my 100th post, I am trying to get 100 fans on my Facebook page by my blog-anniversary (April 11). So if you haven’t already, like me on Facebook. You’ll get post previews and other cool stuff. Thanks to all of my loyal readers and those who have stopped by over the past year. You’ve made this blog a success!